The crowds start filing into Castellón’s Plaza Mayor bright and early at 7am on Sunday morning. Roughly half of them have slept… the rest have apparently spent the night partying. After arriving, we joined a queue which stretched for blocks around the town center, to pick up our cañas: reeds tied with a green ribbon that we’d be using to hike. And it was just the first of many lines we’d be waiting in throughout the day. Jürgen and I aren’t Catholics, but since we were about to embark on a pilgrimage, it seemed fitting to attend mass in the cathedral. After pretending to worship, we went outside to cheer the queen of the festival, along with her court. These girls are clad similarly to the falleras of Valencia, but their dresses have a shorter cut and less ostentatious decoration. 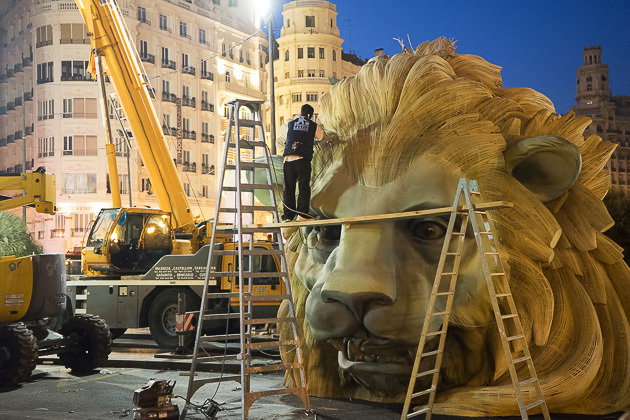 In Castellón, the neighborhood casales are called gaiatas, and instead of Fallas monuments, they each construct a giant illuminated float. 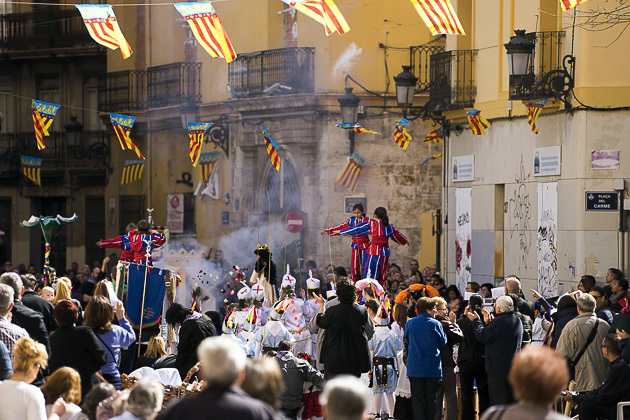 The Romería marks the beginning of Castellón’s week-long Fiesta de la Magdalena. The Queen had waved at us, which seemed like good luck, so we now jumped into the river of humanity which was flowing through downtown Castellón. Soon we were out of the city, walking past fields of orange trees, and even across a highway, to the Hermitage of Mary Magdalene. It was a diverse crowd — children, parents, dogs, young people and an impressive number of elderly ambling slowly along the path, conversing, and sharing sips of wine from their botas. 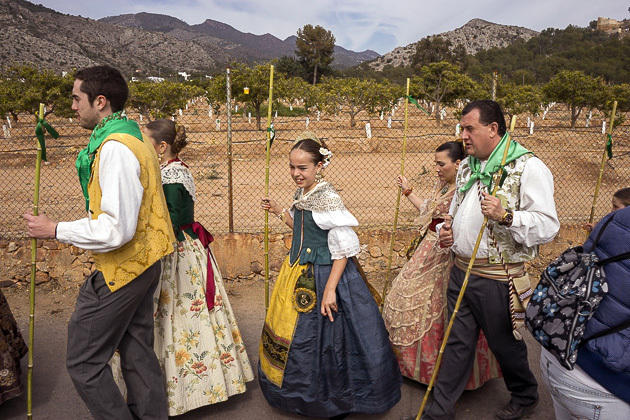 Almost everyone was wearing green handkerchiefs and many had ribbons pinned onto their coats, from the previous romerías in which they’d participated. Some of the older pilgrims had collected dozens of such ribbons. We arrived at the hermitage after a leisurely hike of about two and a half hours, and waited patiently in line to enter the small church. This pilgrimage has a history of 75 years, and is meant to commemorate the journey of Castellón itself. In 1251, the entire city was moved from this hill to its present location, lower in the fields. Duty done, it was finally time to relax. We found a spot on the hill alongside thousands of other exhausted pilgrims, and devoured crusty Rollos Magdaleneros, circular breads traditional to the romería which were being distributed from the back of a truck. Not nearly enough food to replenish our bodies, but luckily this was but the first course; after a mascletà signaled the arrival of the queen and her court, we got into line for paella. Now, this wasn’t just any paella. It was monumental: a monstrous pan, three meters in diameter, with enough rice to feed thousands. The size of the line was perhaps even more impressive than that of the pan! We joined in, and waited for over an hour. When we finally arrived at the pan, half the paella remained and the chefs gave each of us two heaping plates. “The second plate is for dessert,” they insisted. God help us, we ate it all. And after such a disgusting display of gluttony, we were exhausted. But one final, unbelievably long queue remained, for the bus back to Castellón. I was so tired, I might have fallen asleep on my feet. It had been tiring, but this was an unforgettable day; the first pilgrimage either Jürgen or I had ever participated in. Outside Spain, Castellón’s Fiesta de la Magdalena is practically unknown, but it’s quite an event for locals. If you’re interested, it starts on the third weekend of Lent; the date can be radically different year-to-year, so make sure to check the schedule. The Romería a la Magdalena in Castellón We tend to get so wrapped up in Fallas fever, that we forget about festivals happening in other places. Luckily, we have friends to remind us. This year, one such friend took us to Castellón for the Romería a la Magdalena: an eight-kilometer pilgrimage in which seemingly the entire city participates. So very, very cool!Thanks for sharing… I may have to visit that next year!